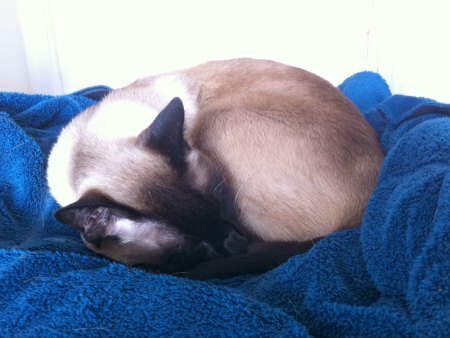 Welcome to the first of this year's Meezer Musings! As it's already the beginning of February it's a little late to wish you a happy New Year, but I hope you had a good January. 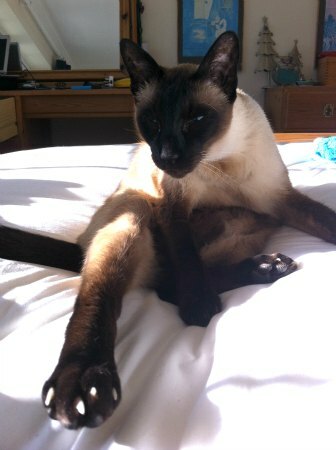 If you've been following Meezer Musings for a while, welcome back, and if you're new here, a very warm welcome to you! I'd intended to get the first of the year's newsletters out last Friday, which would have made it the January newsletter. Unfortunately fate had other ideas, and a couple of weeks ago my husband and I came down with a 'flu-like virus and have been able to do very little since. For the first week, all we could do was lie in bed and cough. We were coughing so much that we kept waking each other up, so my husband took himself off to sleep in the spare room. Poor Bandit didn't know what to do with himself! He usually sleeps at the foot of the bed between us - but once he'd figured out where we both were, he was a very good nurse and took turns keeping us company, dividing his time between the two of us as best he could. Siamese cats are of course known for the bonds they form with 'their' humans, and their love and devotion once those bonds have been formed. 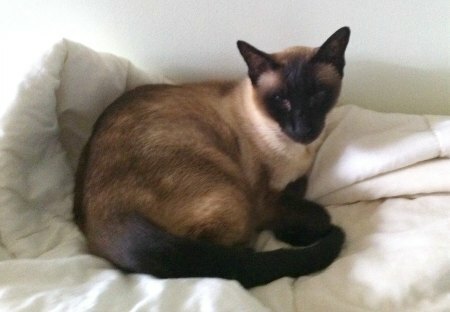 And from letters I've received, and time spent browsing social media where I've seen many photos of other Siamese cats nursing their humans, it seems clear that they're very well able to sense when people (and especially children, for some reason) are sick. Not only are they not as active and mischievous as they tend to be when all's well, but they spend long hours just lying peacefully by your side until you're back on your feet again. Taking time off from nursing for a good wash and brush up! So now you know why Meezer Musings is a week late coming to you. As you'll see at the top, I've called it the 'January/February' newsletter, and because of this I'm going to make a change to the day that I send it out in future. Rather than sending Meezer Musings out on the last Friday of the month, I'll send it out on the first Friday, so that the next newsletter and subsequent ones will go out at the beginning of the month rather than the end of it. This change will also allow me to send out a newsletter in December, which I've never been able to do before as things are always so hectic around Christmas. While we've been sick a number of emails, messages and stories have come in and I haven't been well enough to process many of them. So, if you're waiting for a reply, I'm sorry! Once this newsletter goes out, I'll have more time for other things and you should receive a message very soon. Now, I'd love your help! I was looking at our site statistics recently and discovered that there are now nearly 1400 of you subscribed to Meezer Musings. Some of you I know, of course, through our Facebook page and from your messages and stories. But 1400? That's astonishing and very lovely! And I'd like to know a little more about you, and your cats, and hear more from you about what you'd like to read on this website. So I've devised a little survey. The survey is in two short sections. The first, which you'll find below, is all about you and your cats. The second part, which will come next month, asks about the kind of information you'd like to see here on this website. The survey is completely anonymous - you're not required to leave your email address or provide any personal details, and it will only take you a matter of minutes to complete. But it will allow me to know a little more about you, and in turn, what sort of articles to provide for you in the future. So, if you'd like to help out, check whatever information is relevant for you in the questions below, and once you've done that, click the 'Submit' button at the bottom of the survey to send me your answers. This section of the survey is now closed. Many thanks to everyone who took part in it for your very helpful replies and comments. Meezers of the Month. Happy times from Facebook! Our joint Meezers of the Month this month are two cats who didn't have the very best start in life, but who found their 'forever' homes with caring new people. You may remember that back in September last year we featured some photos of kittens from Joanna Donley, who fosters for the Silicon Valley Pet Project. All the kittens had been fostered with Joanna and have since gone to lovely new homes. In December Joanna shared another photo with our Facebook page of kitten Titus, who in an epic 'foster fail' was given a new home with Joanna herself. Here he is, napping under the Christmas tree. What a lovely way to celebrate Christmas and start the New Year. Have lots of fun and a very happy life, little Titus! 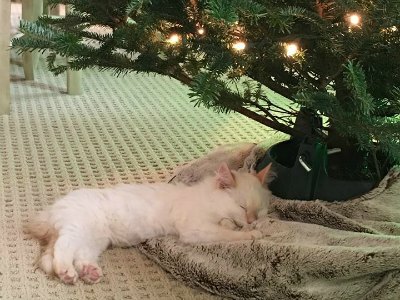 "Santa Baby, leave a kitten under the tree ..."
In another heart-warming story, Darlene Konduc shared with us some details about her boy Caesar, whose 'birthday' is on the 28th December - the day that Darlene collected Caesar from a Walmart parking lot eight years ago. Darlene said: "No-one wanted him. He was cross-eyed. The people bugged me to take him, he was part of a litter. I saw that lovely face and was hooked. I was afraid of what would happen to him." Darlene has rescued many cats in her time (you can read the story of another of them, 'Cool Hand' Luke, here) so Caesar was extremely fortunate that Darlene came across him when she did, and I know he's had, and will continue to have, a very happy life with her. That's all for this month, as I'd really like to get this to you before another week goes by. We'll be back at the beginning of March, though, with a summary of the results of Part 1 of the survey, and Part 2 for you to complete. 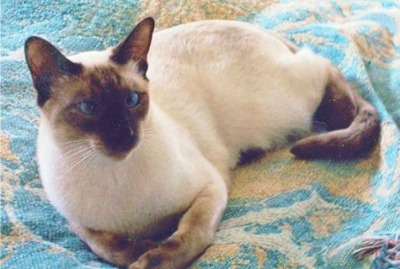 As well as updates to the site, stories, photos, our Meezer of the Month, and fun from Facebook. Have a great month meanwhile!